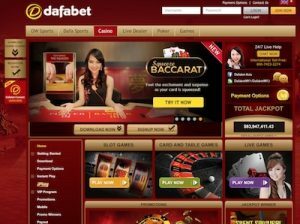 Dafabet.com is most well-known as an online sports betting site, but it also offers a comprehensive online casino for players who want to bet real money on classic casino games like the slots, blackjack, roulette, poker, video poker, live dealer games as well as a handful of niche games. We explore what Dafabet’s casino site has to offer to determine whether this is a good choice for real money players. What players does this casino cater to? Dafabet is licensed in the Philippines by the Cagayan Economic Zone Authority (CEZA) and First Cagayan and has a distinct focus on the Asian market while also accepting registrations from a wide range of other countries. Multiple currencies are accepted, with payments available using many Asia-specific deposit methods, making this an especially great choice for players from Malaysia, Thailand, Indonesia and China. Dafabet Casino does not accept players from United States of America or its territories, France, Belgium, Germany, Hong Kong S.A.R, Macau S.A.R., Taiwan, Singapore, Israel, United Kingdom, Cyprus, Czech Republic, Ukraine, Romania, Estonia, Poland, Columbia, Philippines, Turkey, Spain, Portugal, Italy, Switzerland, Ireland, Australia, Bulgaria and the Dutch Caribbean Netherlands Antilles. New players at Dafabet can claim a 100% matched deposit welcome bonus when depositing real money to the casino for the first time, with up to RMB 688 up for grabs at the time of writing. From what we’ve seen, this welcome bonus seems subject to change regularly so we recommend you check at the Dafabet.com to see what sign-up bonus is currently being offered. In addition, there are all kinds of special one-off promotional offers happening at Dafabet, so just head to the ‘Promotions’ page to see what’s available. There are separate bonus offers available for casino, but you can also take advantage of the other promos being offered in Dafabet’s sports betting and online poker sites. Always read the terms and conditions available underneath a promotion or among the casino’s t&cs. Additionally, always gamble responsibly. Dafabet offers a VIP program where registered players can earn points every time they play for real money at the casino to climb higher through different loyalty tiers and get access to some excellent bonuses and special offers. New players start at Premiere or Prestige level and can choose to enter either the Slots Club or Cash Back Club, with different bonus rewards available for each. Once again, read the terms and conditions attached. Dafabet Casino offers players the option of playing directly via browser-based play with no downloads required, or by downloading the free online casino software. Most players opt for the ease of instant-play these days, but the downloadable option may be appealing to the few players who continue to prefer to play via an exclusive casino client. We were surprised to discover that Dafabet does not allow you to sample the casino games until you have signed up for an account, which may be a deterrent for some players. A mobile casino is also available for instant-play and via downloadable apps. Dafabet has a separate native app available for its online casino and online poker sites. There’s also several variations of video poker available, and a handful of niche arcade-style games like Heads or Tails, Penalty Shootout, Bonus Bowling and Dice Twister. For live dealer fans, Dafabet has both the Asian and European markets covered, with a separate Asian live dealer section and European live dealer section. The Asian live dealer section offers the most games, including live Baccarat Squeeze, Emperor Live Baccarat, Emperor Live Roulette and multiple others. The minimum and maximum deposit and withdrawal amounts vary depending on the payment method selected – you can find further information about each payment method and its limits on the banking page at Dafabet.com. The Dafabet Customer Care Centre makes sure players are taken care of at every turn, offering multiple contact methods so you can play with the peace of mind in knowing assistance is available whenever required. There’s a detailed FAQ section, email contact form, direct email details for different departments, live chat operating 24/7, Facebook page, text messaging service and international help lines available for many different countries. Just head to the ‘Contact Us’ page for full details regarding the line of contact you wish to follow. Dafabet Casino is one of the more reliable and advanced online casino sites we’ve come across that caters specifically to the Asian market and we were pleasantly surprised by what we found during our testing of the casino. Dafabet seems to be well licensed and regulated within the laws of the Philippines and despite the layout being slightly outdated, this is a pretty user-friendly site that’s easy enough to navigate. The fact that it caters to a large list of countries, currencies and payment methods is a big tick from us. The cons of Dafabet Casino include the fact that you can’t sample games until you’ve signed up for an account (something we don’t often expect from leading online casino sites) and the slightly smaller selection of online slot games than we ideally like to see. However, the fact that games are powered by leading software provider, Playtech, makes up for this as the selection of games that are available are of the highest standards. All up, Dafabet Casino appears to be a secure and reliable site with some great ongoing bonuses and promotional offers (t&cs apply) and would make a particularly great choice for Asian players from accepted countries like China, Malaysia, Thailand, Indonesia and Vietnam.